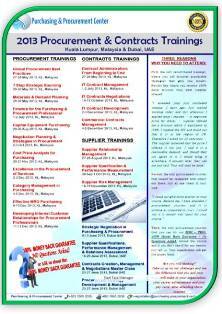 If you are looking for any procurement training for yourself and your team, you are at the right place. When you download the brochure you will find a list of 40 plus purchasing trainings with full course description and a list of the world class procurement experts who can do these courses for you. To get the brochure for all the procurement courses, enter your details on the right and the brochure will be sent to your email. The brochure contains the full outline for each training and the benefit you and your team would obtain when attending. Click here to update your contact details and get the brochure with full outlines sent to your email.